Julyen Hamilton’s performances are characterised by a number of different reoccurring elements. These elements have been deeply researched and prac=ced over the years. They involve light / sound / space / text and speech ….and the use of objects. His decor work and use of objects in the space is of essence and accompanies all of his theatre pieces. ObjeCtS placed, handled, spoken to, danced beside, destroyed and created … all reveal a particular poetry especially when in the context of the ‘naked’ dancer’s body. We will take a look at this subject, working the body thoroughly and in the context of objects ‘on stage’. We’ll consider and practice how to enter into poe=c relationships with objects and discover how they can participate and reveal further layers of imagery in performance. 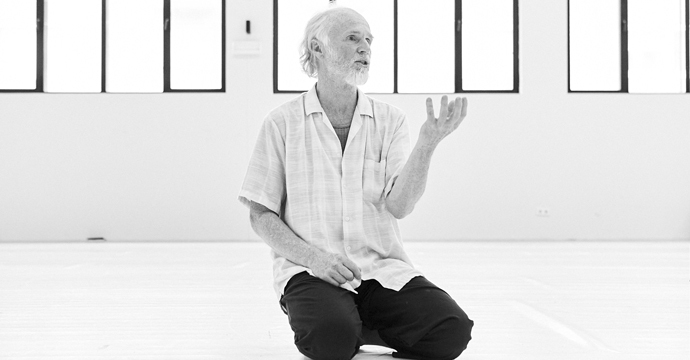 “I have been making dances, directing and teaching for the past 40 years. My work, both in company and solo, develops dance for the theatre – a place where an atmosphere of transformation, insight and understanding is permitted without resort to thin conclusions. This material is fresh to the intelligence of the moment and also linked to the months years and epochs that it has been gestating in the individual and the individual’s history. It is the voice of the itinerent more than the sedentary being. I sense that the intelligence of the mover comes from the whole body thus the rational lives alongside a vision of things as they change – as they are being and becoming. Over the years I have had three companies, the present one based in Brussels, Belgium is named : ‘Allen’s Line’.